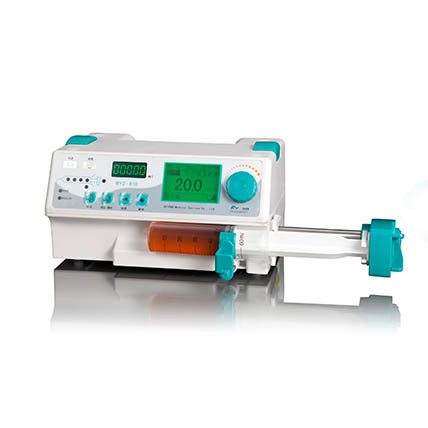 BYZ-810 Single channel syringe pump is widely used in clinical subjects of conventional intravenous injection, anesthetic injection, inject anticoagulant and cancer chemotherapy patients. It can apply to medical intensive care unit, neurology intensive care unit, etc. 1. Work mode: Rate mode, Time volume mode, Dosage weight mode are optional. 2. Human voice alarm systems: A real-time voice alarm systems make troubleshooting more timely, which greatly reduce the occurrence of medical fault. 3. 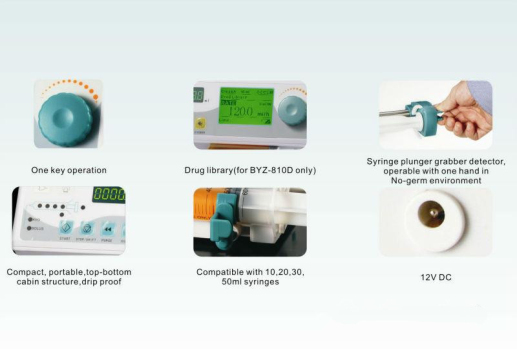 Universal syringe: Built-in variety of syringe brands and supports automatic use, guaranteeing accuracy of all brands injection syringes. 4. 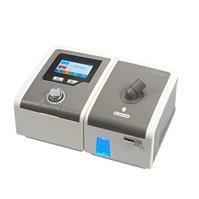 Precision drive system ensures the accuracy of injections and improves transfusion safety. 5. Large LCD screen: The system uses high-definition display screen, achieving user-friendly operation. 6. The vein open function (KVO rate) can prevent back flow of blood. 7. Bolus can be quickly evacuated gas pipeline before starting the infusion, and increase the dose after starting. 8. Multi-drug combination: Single channel can be superimposed into a multi-channel free combination, can also be combined into a split-occupied 2-8 channel, resulting multi-drug combination forward. 1. It can be widely used in clinical subjects of conventional intravenous injection, anesthetic injection, inject anticoagulant and cancer chemotherapy patients. 2. It can apply to medical intensive care unit, neurology intensive care unit, etc. 3. This pump is not available for target controlled injection of narcotic drugs, insulin, does not apply to high-pressure injection, please choose the right products according to the specific needs of use.